As Hurricane Katrina sideswiped New Orleans, windows blew out in the buildings next to our hotel on Common Street. Sheets of glass fell and shattered on the street. Reams of paper flew out from the now breached office windows. It was like watching one of those old New York City ticker-tape parades. As a reporter it was always frustrating covering hurricanes in the moment. Your field of vision is narrow. You can only report on what is happening around you. It is after the storm has passed when you get a better sense of the larger picture. Katrina was different. In the late morning when the wind subsided, we drove out to get a better perspective of the damage. You know how some things always stick with you? For me, on that day it was the drive along Elysian Fields Avenue. As we headed towards Lake Pontchartrain I kept thinking, “Why is there so much water? It hadn’t rained that much during the storm.” At least, I didn’t think it had. As we drove closer to the lake, the water kept getting higher. We stopped. An elderly man was sitting on his porch. With the water above our knees, my camera crew and I waded over to him. I asked, “Have you ever seen the water this high before?” “Not since Hurricane Betsy,” he said. Perhaps we were standing, and didn’t know it, in the first of the flood waters. To this day I still wonder. That night, people poured out of the hotels along Canal Street. Many were locals who rather than stay in their homes during the storm got rooms in the French Quarter. They were smiling, laughing, and raising glasses. It was festive. New Orleans had dodged the bullet again they thought. The next morning, I woke up, looked out my hotel room window and saw water and cars parked along the sidewalk bobbing in it. We all know what happened after that. Recently, I went back to the Gulf Coast to work on a “Ten Years Later” story. I don’t care to call it an anniversary. For me, anniversaries should be reserved for happy occasions. After Katrina, Bay Saint Louis, Mississippi was called part of the forgotten coast. 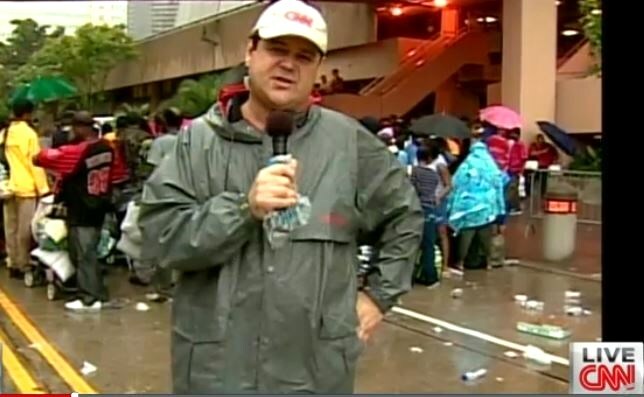 So much of the media attention went to New Orleans that places like Bay Saint Louis, Biloxi and Gulfport fell out of the spotlight rather quickly even though they took Katrina’s direct hit. More than twenty feet of water covered Bay Saint Louis. There were, the Mayor told me only fifty homes out of forty-five hundred that were not completely destroyed. Today, the city is back. While I was there, there was street festival along the rebuilt waterfront. A truck drove around delivering bags of ice to keep drinks cold. A decade ago, you need ice here just to survive. The wounds Katrina left behind have healed. There are of course still scars, an overgrown slab of concrete where a house once stood. But driving through the city you would never know what happened here a decade ago. The mayor says, this rebirth would never have been possible without the Federal Government, FEMA, and private donations that allowed Bay Saint Louis to build back better, stronger, and more resilient. If there is a next time, Fillingame says they are far better prepared. Jesse Shaffer lived through not one but two bad chapters. Shaffer and his family lived outside New Orleans. 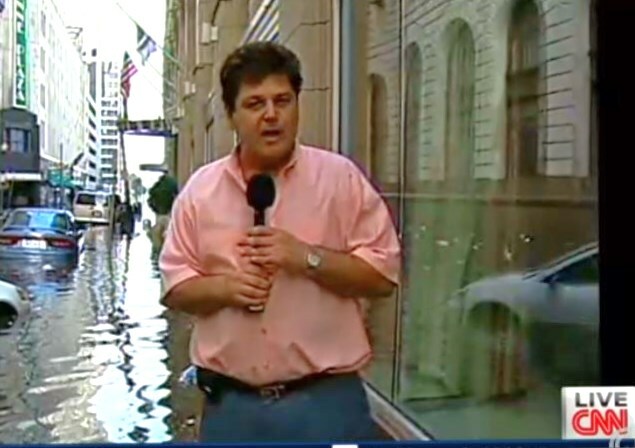 When Katrina hit, ten feet of water flooded their neighborhood. He and his neighbors rebuilt. “You live here and you don’t want to move away. You lose all your friends,” Shaffer said. And not far from them, almost in their shadow, a massive concrete and steel flood wall was constructed to keep the water out in case it happened again. Problem was, the Shaffer’s neighborhood was just outside the wall. And seven years to the day after Katrina, it did happen again. Hurricane Isaac. The old clock on the mantle stopped at five minutes to three in the morning when the water rose above it. This time, it wasn’t ten feet of water. It was fourteen feet. But unlike Katrina, the people here didn’t evacuate for Isaac. “It wouldn’t be, couldn’t be as bad,” they thought. The Shaffer’s don’t live here anymore. Virtually no one else does either. Of the seventy-five or so homes in the neighborhood Shaffer says only one is being lived in. What you see now along the Gulf Coast is a testament to the human spirit, a testament to our ability to endure and prevail. Communities were rebuilt. Lives were saved. A decade after the Katrina nightmare, the page has turned. But, make no mistake, the book is not yet closed. Everyone will tell you there is still much work to be done. Some of the hardest hit areas of New Orleans are far from healed, but there is progress. And for the people of Mississippi and Louisiana, they are starting to believe the storm has finally passed. The Federal Alliance for Safe Homes, Inc. (FLASH)® offers the following cleanup, insurance, and safety tips for families preparing to return to flooded homes. Stay tuned to local news organizations for important announcements, bulletins, and instructions. You may not have immediate access to your home. Roads could be blocked, power lines could be down, and people may be trapped or in need of assistance. Make sure you have current identification. You may have to pass through identification checkpoints before being allowed access to your home/neighborhood. Do not attempt to drive through floodwaters. Remember the slogan, Turn Around, Don’t Drown® as there could be unseen dangers such as downed power lines, debris, or washed out roadways. Check for building stability before entry – sticking doors at the top may indicate a ceiling at risk of collapse. Check foundation for any loose or missing blocks, bricks, stones or mortar. Assess stability of plaster and drywall – any bulging or swelling ceilings indicate damage that should be removed. Press upward on drywall ceilings. If nail heads appear, drywall will need to be re-nailed but can be saved. To prevent warping of wooden doors, remove and disinfect all knobs and hardware, and lay flat and allow to air dry completely. Remove wet drywall and insulation well above the high water mark. Take extensive photos and video for insurance claims. Only flood insurance typically covers damage from floods. Remove damaged items from the home. If you need evidence of damage, save swatches (carpet, curtains, etc.) for your insurance adjuster, and learn more about insurance from the newly-updated insurance guide, If Disaster Strikes Will You Be Covered? Consider having licensed, bonded professionals inspect your home for damage and help in repairs. Wash and disinfect all surfaces, including cupboard interiors with a solution of 1/2 cup bleach to 2 gallons of water. Remove sliding doors and windows before cleaning and disinfect the sliders and the tracks. Clean and disinfect air conditioning, heating, and ventilation ducts before use to avoid spread of airborne germs and mold spores. Use fans and allow in sunlight to dry out interior spaces. To avoid growth of microorganisms, household items should be dried completely before they are brought back in the house. Remove wallpaper and coverings that came into contact with floodwaters. Don’t repaint or repair until drying is complete and humidity levels in the home have dropped. The National Archives Websitehas information on how to clean up your family treasures. Although it may be difficult to throw certain items away, especially those with sentimental value, experts recommend that if you can’t clean it, you should dispose of it, especially if it has come into contact with water that may contain sewage. For more information on protecting your home from flooding, visit www.flash.org, or FEMA at www.ready.gov.